Telligent will be exhibiting here (space #4 on the floor). Please say hi to the team! We're excited to let you know that in our continued alignment with Verint and our investments in support we have migrated to a Telligent dedicated system for our case management. This migration entails a few changes that we want to ensure that you are aware of so that your support experience can be as smooth as possible. I'm presenting an overview of 9.0, going through a product demo and will talk a little about our roadmap and future investment. We'll be in New Orleans September 30th - October 1st at Sitecore User Group Conference North America we're not exhibiting at this event, but we're likely going to organize a meetup. We'll be in London the week of October 7th for the London Telligent User Group meet-up and the Verint Engage Customer conference October 8th. We're wrapping up our 7 city tour with Sitecore. 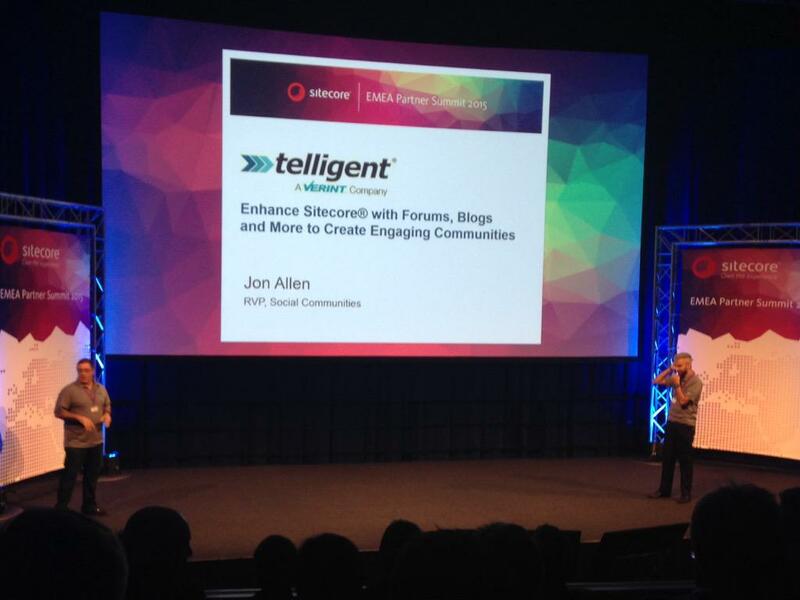 Jon Allen, our RVP of Field Operations, delivered our keynote in Copenhagen, Frankfurt, and London. I met up with the team in London and delivered the keynote for Antwerp, Zurich and Paris. We've got one more event in Stockhom that James Crisp will keynote. Sitecore has been an important partner to Telligent since 2008 and our participation in Sitecore's EMEA Partner Summit event as a Diamond sponsor will enable us to reach over 900 Sitecore partners and share with them the exciting investments we are making with Sitecore. Telligent—a leader in software for customer support and digital marketing communities—is pleased to announce that it has become part of Verint, a global leader in Actionable Intelligence® solutions. Now the same great enterprise-class customer and employee community solutions that the industry has come to know from Telligent are part of a market-leading customer engagement optimization portfolio.